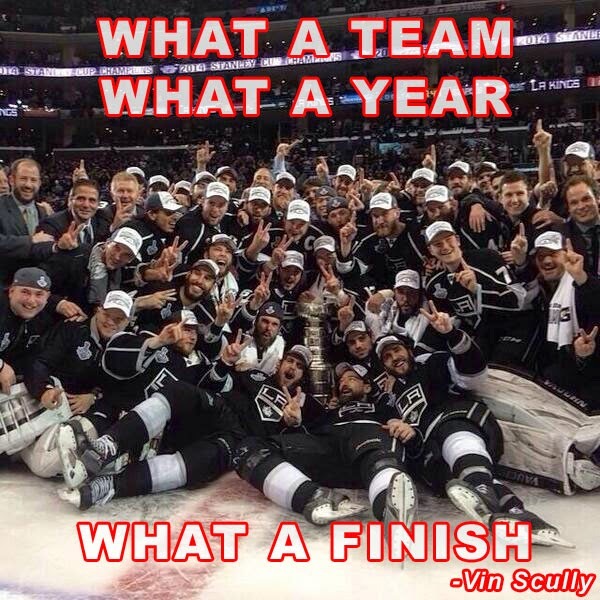 Tonight is Game 3 of the Western Conference Finals between the Kings and Chicago Blackhawks. The series is coming to Los Angeles for the first time, and I'm hopeful we can pull out a victory It has been a series of mostly downs for the Kings, as they find themselves behind, two games to zero. Heck, I am more nervous about this game then I have ever been over the past two seasons. 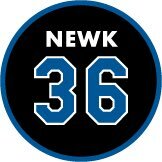 The Blackhawks are a great team, and to be frank they were the team that worried me the most coming into this postseason. Furthermore, it doesn't help that the Kings are experiencing a spate of injuries that figures on hampering the team. They just lost their second-line centerman to concussion-like symptoms, their current 3rd-line centerman just came back from the same thing, and there are whispers that other key players are currently playing hurt. Of course, this is hockey and none of these things are unusual. They just have to find a way to battle through it. On the positive side, rookie forward Tyler Tofoli has been outstanding. He came to LA late in the season and has been very impressive. He is slated to be a future big game, high-scoring star, so to witness him develop this quickly over the past several weeks has been incredible. For Dodger fans not familiar with him, just think of a smaller, Canadian version of Yasiel Puig. 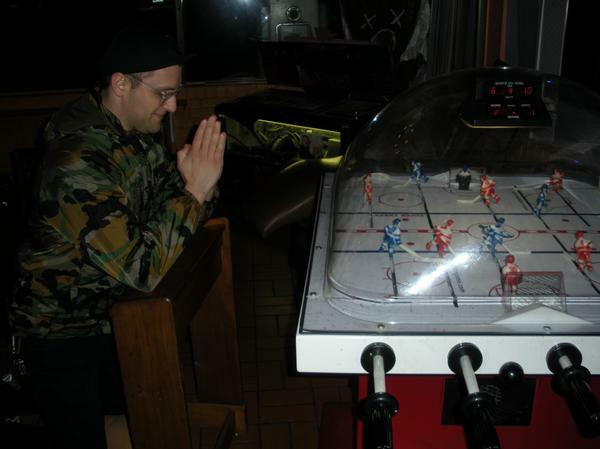 So, I come into tonight's game excited about the match-up, but nervous - nervous as heck. Congratulations, Stephen Fife, on your very first Major League win. May there be many more. 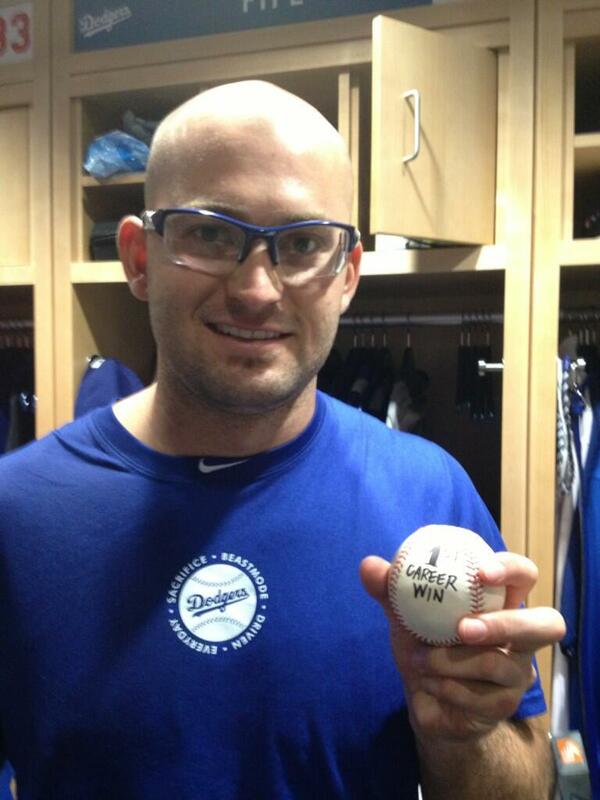 Pic via twitter @DodgersPR. Via Chosun Ilbo, "Dodgers' Ryu Gives Sales of Baseball Merchandise a Boost". Scott Elbert's rehab assignment has not gone well. Via a tweet from Eric Stephen of True Blue LA. Eric followed the above up another tweet indicating that Elbert has an appointment with Dr. Neal ElAttrache tomorrow. Tommy John surgery looms? Here's Eric's story at True Blue LA. The Jackie Robinson game-used glove auctioned by Steiner Sports just sold at $373,00.00, via Mark Newman at MLB.com. 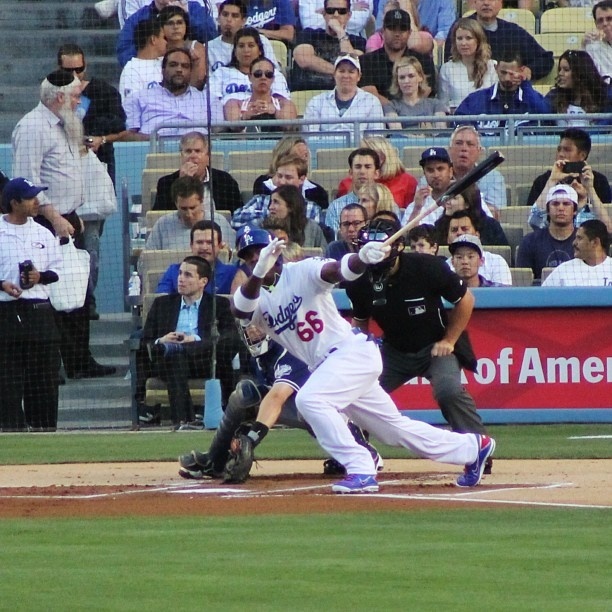 Yasiel Puig's 1st Dodger game was definitely memorable. In addition to recording his first two Major League hits, he nailed a runner on 1st base to end the game. Wow! 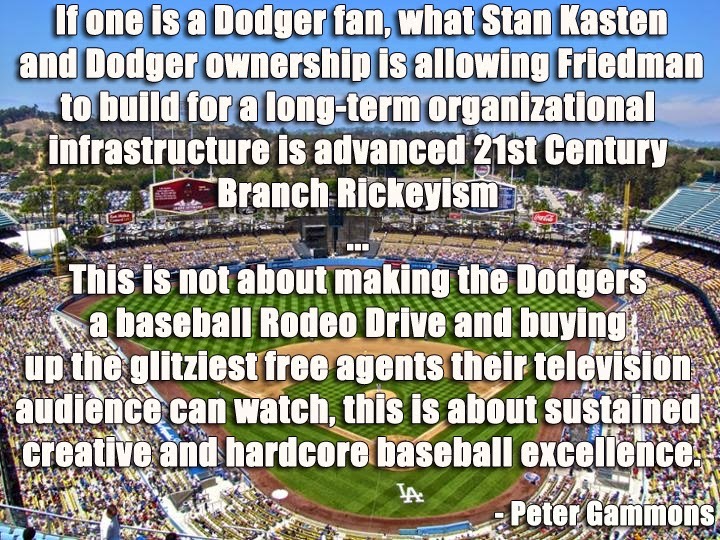 Via Bill Plunkett, let's not forget that Puig isn't the only person responsible for that last out. Yasiel Puig's laser from the RF wall was eye-popping but #Dodgers 1B Adrian Gonzalez said real heroes on the play were middle infielders Luis Cruz and Nick Punto. Padres baserunner Chris Denorfia was running on the pitch and slid into second base when Cruz and Punto pantomimed a double-play grounder. Denorfia had to scramble to his feet and was called out on a very close play at first base. If you haven't seen the play, below is the catch and throw to end last nights game. Below is a video of Puig's first two Major League hits. BTW, if you're interested in picking up a unused ticket from the game to commemorate Puig's first game, check out this eBay auction. If you want to check out a bunch of pics from yesterdays game then there is no better place than Jon SooHoo's Photog Blog. 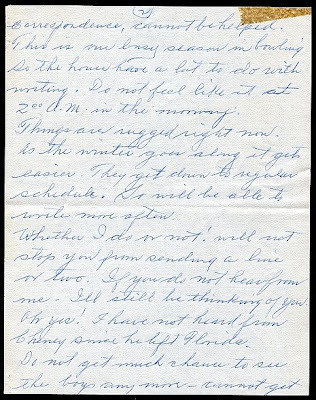 Here is another edition of Dodger Correspondence that focuses on an old letter written by a former Dodger. 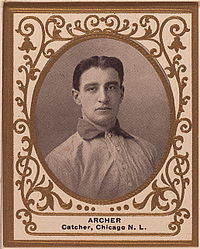 This time, I share a letter written by one-time Brooklyn Robins catcher Jimmy Archer. Heck, calling him a former Dodger is a bit of a stretch. 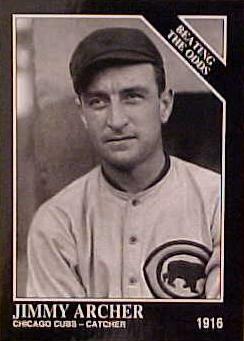 He wore Blue for less than a month during the 1918 season. He was signed as a recently released free agent during the middle of the year, then was sold to the Reds shortly thereafter. 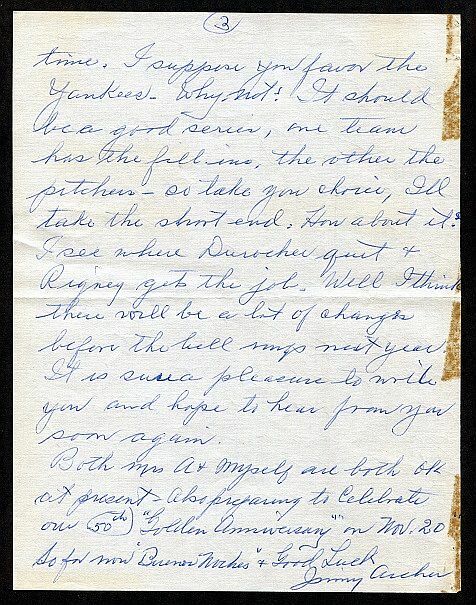 Regardless, Archer exhibits a True Blue spirit in the letter shown here, even though he played only 9 games for us. 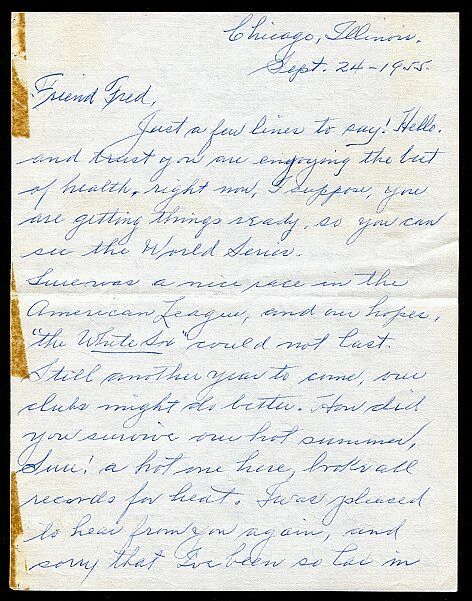 This letter is addressed to a Fred Arnold on September 24, 1955. Arnold was an avid Baseball fan and collector who was known to have become a pen pal with many former players; including Jimmy Archer. 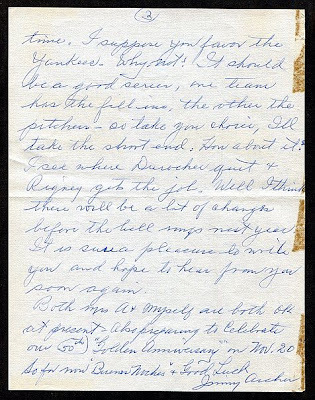 In this letter Archer discusses the upcoming 1955 World Series match-up between the New York Yankees and Brooklyn Dodgers, as well as other tidbits. Just a few lines to say! Hello, and trust you are enjoying the best of health right now, I suppose, you are getting things reading, so you can see the World Series. Sure was a nice race in the American League, and our hopes, "the White Sox" could not last. Still another year to come, our clubs might do better. How did you survive one hot summer, Sure! a hot one here, broke all records for heat. 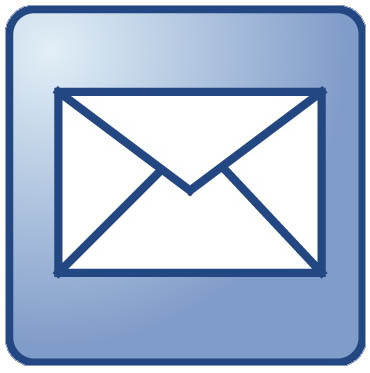 I was pleased to hear from you again, and sorry that I've been so lac in correspondence, cannot be helped. This was one busy season in bowling so the hours have a lot do do with writing. [He ran a bowling alley.] Do not feel like it at 2:00 A.M. in the morning ... I have not heard from Cheney [former big leaguer] since he left Florida ... I suppose you favor the Yankees - Why not. It should be a good series, one team has the fill ins, the other the pitchers - so take your choice. I'll take the short end. 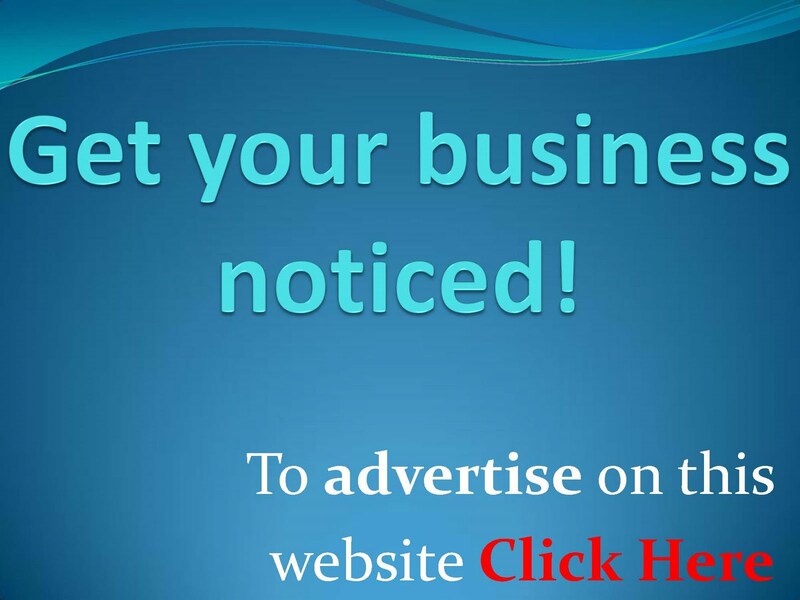 How about it! 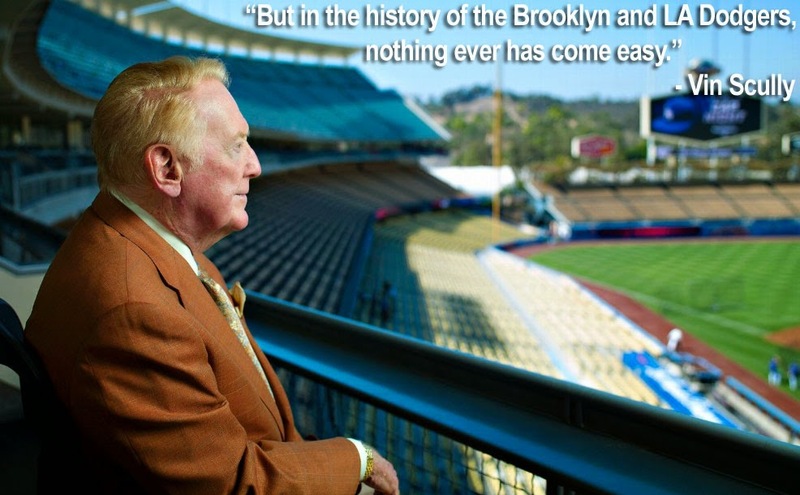 [The Dodgers ended up finally defeating the Yankees.] I see where Durocher quit & Rigney gets the job. [Rigney replaced him as Giants' manager.] Well, I think there will be a lot of changes before the bell rings next year. It is sure a pleasure to write you and hope to hear from you soon again. Both Mrs. A & myself are both OK at present - Also preparing to celebrate out 50th "Golden Anniversary" on Nov. 20 . So for now 'Buenos Noches' & Good Luck Jimmy Archer." It's really amazing how often this type of banter existed between a former player and fan in the old days. 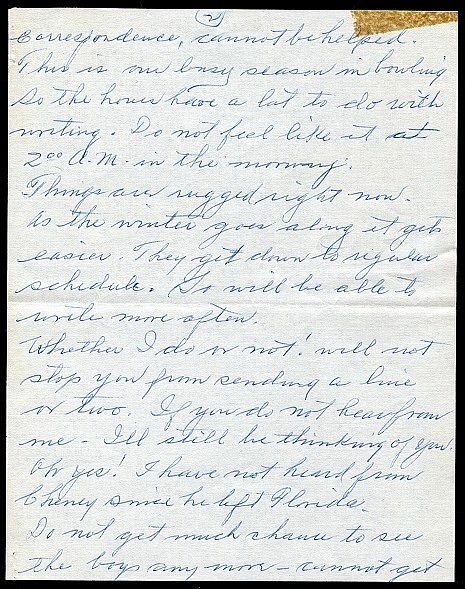 Correspondence was much more difficult back then, so there was a greater sense of appreciation when a fan tried to get a hold of you. As a result, a lasting friendship would sometimes occur that might shock folks today. BTW, Archer was a world class bowler, and even served as a promotional director for the Congress of Professional Bowling Alleys. His prowess on the lanes shouldn't be surprising since he was known during his playing days for having the best throwing arm of any catcher during the Deadball Era. 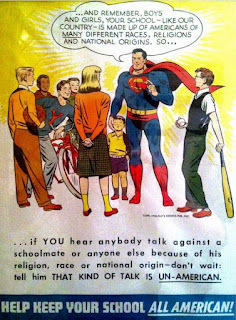 I also want to add that his athletic days pale in comparison to his act of quick thinking and heroism as a hog purchaser for the Armour Meat Packing Company. In 1931 two truck drivers where overcome by carbon monoxide and passed out in the Union Stock Yards in Chicago, and Archer came to their rescue. He brought them both back to life.